Quiet operation is the hallmark of the Comfortmaker name, a sign of the quality you can count on. The technology and craftsmanship compare to premium models from competitors while giving you the best value in cooling. 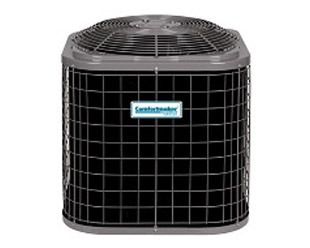 Condenser and coils are 100% leak-tested to assure you of reliability. Comfortmaker air conditioners deliver SEER ratings that make a significant difference in lowering energy bills, so you can enjoy peace of mind with your peace and quiet. 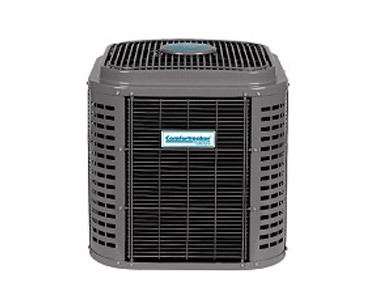 General also offers ductless air conditioners, where the wall mounted unit includes its own compressor. No need to run ducts in the ceilings! We also sell the air conditioning lines of Bryant, Carrier, Ruud and Rheem. Please contact us for information on any of these quality brand name air conditioning systems. Soft Sound SXT Series provides the ultimate quiet, inside and out. The quiet operation comes from solid construction and a host of features to reduce operating sound. A deluxe sound blanket helps contain compressor noise. The two-speed fan motor operates mostly on quieter, lower speed. The advanced aerodynamic fan and air discharge system minimize operating sound. To enhance comfort the two stage scroll compressor runs normally at lower capacity and changes over to higher capacity for even more cooling when the temperature rises. Quiet operation is the hallmark of the Comfortmaker. The durable galvanized steel construction with baked-on paint finish weathers seasonal extremes. The scroll compressor operates with proven efficiency and reliability and the control panel allows for easier, quicker service access.